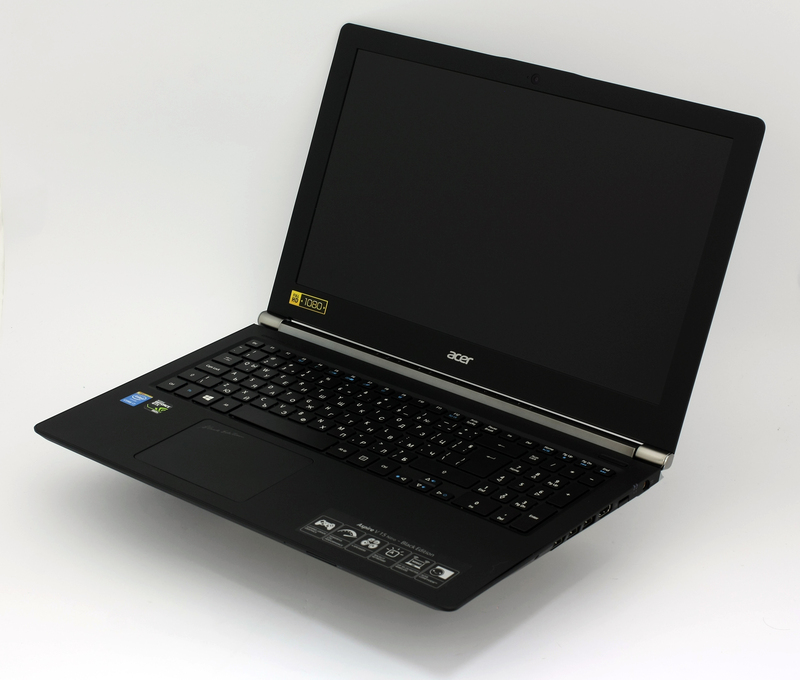 Acer Aspire V15 Nitro Black Edition was arguably one of the best-selling gaming laptops and maybe the first serious step for Acer towards gaming-oriented notebooks. Actually, just by looking at this beauty, it’s hard to say if it’s just a normal notebook or a powerhouse with quad core high voltage Intel CPU and the latest release from NVIDIA – GeForce GTX 960M. 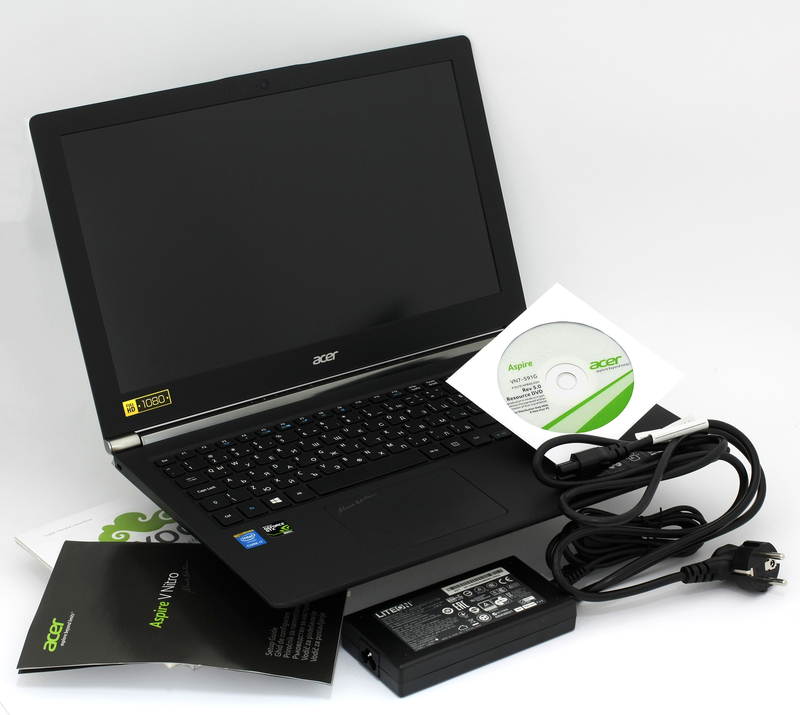 That’s because Acer is offering two variants of the machine – one for normal day-to-day use and one especially for gamers. The Black Edition has a bigger DC charger (since it needs the extra juice given the hardware) and one extra fan for cooling. With the release of the new GeForce gaming GPUs, Acer has renewed its Aspire Nitro Black Edition lineup not only with the new GTX 960M graphics card, but it also offers slightly more powerful CPU from Intel – Core i7-4720HQ. We’ll put that new hardware to the test along with the new LCD IPS panel, which differs from last year’s model. Actually, this is almost new model but the good old chassis. We sure hope the new generation offers the same quality as last year’s variants with GTX 860M. Before you delve into the detailed tests of the Aspire V15 review, take a look at our video review below. The box containing the laptop surely indicates that you’ve bought the “Black Edition” series. The black box, however, doesn’t contain anything out of the ordinary – it has the usual service and user manuals, DVD with drivers, the AC charger and the machine itself. The design of the chassis is actually more than it meets the eye. Well, at least that’s what Acer says. But still, touching the exterior for the first time will probably make you think this is the usual plastic cover, but that’s not the case. 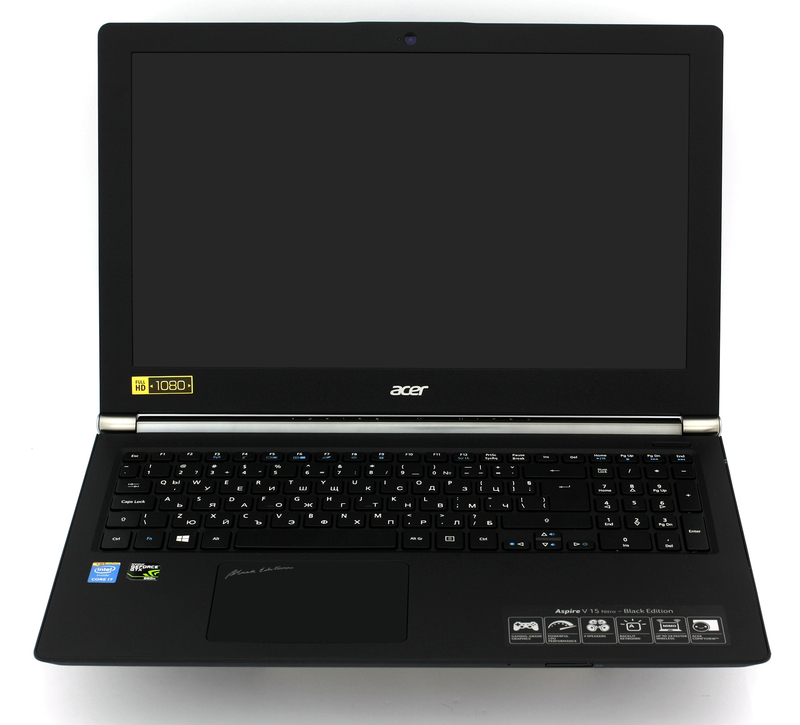 The main frame and the exterior are made of the combination of several materials like magnesium, aluminum, and plastic, fused together thanks to the so-called “Soft touch NIL” by Acer. Nantoimprint Lithography simply fuses on a molecular level the aluminum and the soft-touch plastic making it really premium to touch and keeping the good heat dispersing properties of the aluminum. It has a bit rubberized finish, again really nice to touch, and offers good grip. 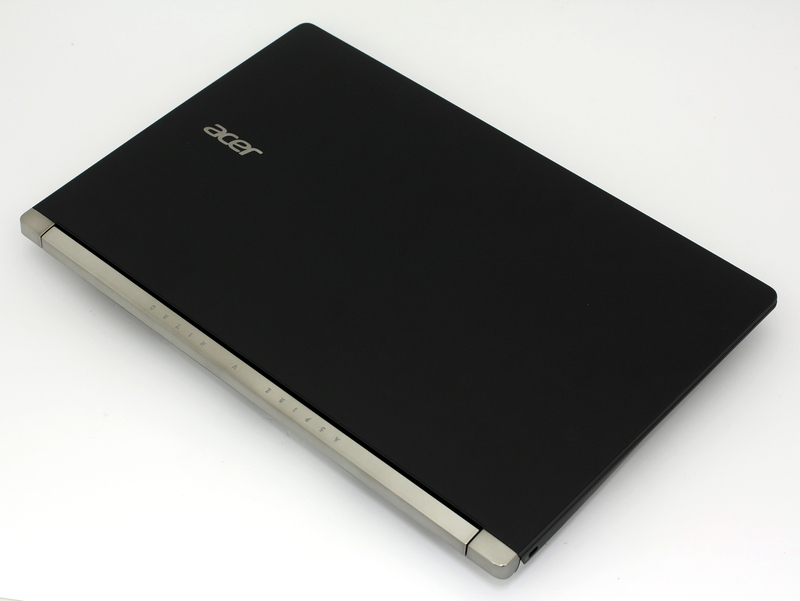 Let’s begin with the lid, which is covered with this soft touch NIL with little engraved lines along with Acer’s logo. On the other side of the lid can be found the built-in webcam and microphone. The top cover is attached to the hinges, which strongly resemble aluminum with chromium color. At the back of the notebook is located the main heat dispersing grill. The bottom of the machine features the same materials used for the top lid but with 6 silicone “legs” and several additional grills, which can be used with an external cooling pad. The sides of the machine are quite impressive, mostly due to the amazingly thin profile (for a gaming notebook) – 23.25 mm. One of the few competitors with such a thin profile is the Lenovo Y50. Nevertheless, the thin profile doesn’t mean lack of the usual ports, which in our case are located on the right side. We are talking about 3x USB 3.0, HDMI, LAN port, 3.5 mm jack and the DC charging port. This is the big drawback of the design – the impractical port placement. Imagine that you use all of the given ports along with an external mouse. That doesn’t seem to be very comfortable and using an external mouse might be a necessity since it’s a gaming laptop, after all. However, the interior has this great soft touch plastic that’s also a fingerprint magnet. You will be surprised how many smudges can be left when using the keyboard for several hours. That, of course, doesn’t affect the great user experience with the keyboard. It practically has everything you need – all the needed “Fn” buttons, including the multimedia ones (unlike the Y50), LED backlight and etc. It’s important to note that the LED backlight is red and it does appear to be less visible than most competitors offering this feature. The keys don’t use the transparent symbols and this makes the red light less visible from above. The touchpad is also well-designed with absolutely no wobbling and it’s responsive as it should be. It also has a “Blac Edition” inscription reminding you that you’ve bought the gaming version of the VN7 series. So, to sum things up – it has great build quality, sleek design, but some details are not thought through, like the port placement. This can be considered as a great flaw for some. But if you are going to use the machine with an external keyboard and display, this can be overcome. 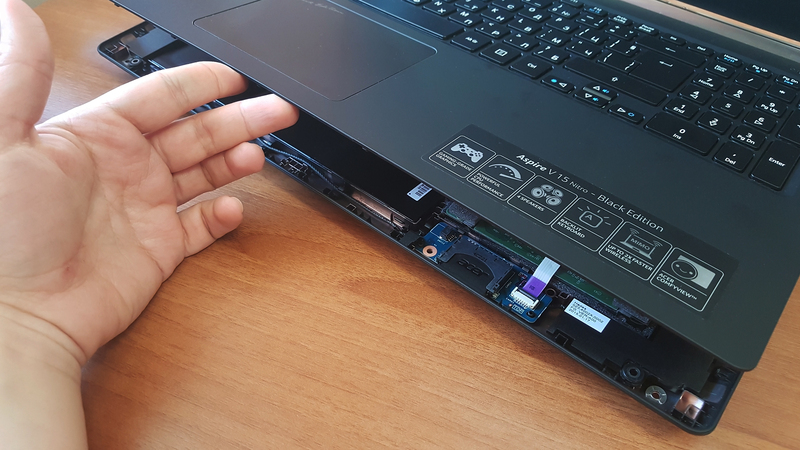 The Acer Aspire V15 Nitro Black Edition offers fairly easy disassembly. The bottom of the chassis is held by 12 screws and when removed, you will need a plastic tool to open the chassis and remove the keyboard. Be careful, though, there are three cables attached to the keyboard, touchpad and the backlight of the keys. Inside you will find the usual 2.5″ slot for HDD or SSD. 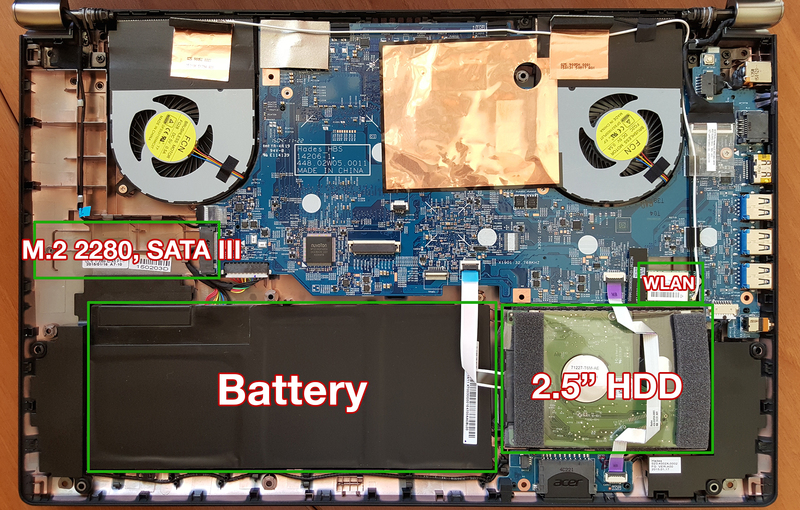 The interesting part is that Acer has continued to offer this model with the option to upgrade with M.2 SATA III SSD, which in this case, is 2280 B&M key. That’s another great plus given the price of the machine. 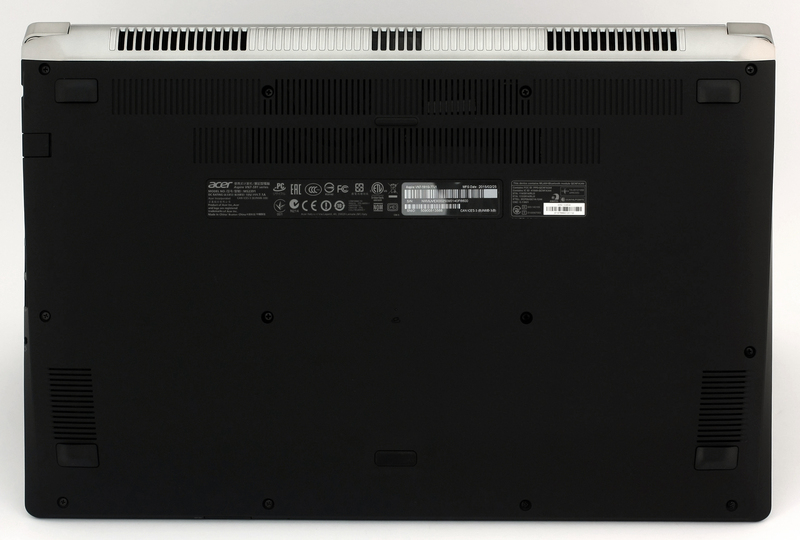 The panel used in Acer Aspire V15 Nitro (VN7-591G, 960M) has a resolution of 1920 x 1080 (Full HD) and uses IPS technology. The manufacturer is LG again, but with a different model – LP156WF6_SPB1. The diagonal is 15.6 inches with 16:9 aspect ratio, 141 PPI and space between each pixel – 0.18 x 0.18 mm. Here’s the display viewed with a microscope at white background. Due to the IPS panel, the display has good viewing angles and there’s no image distortion at 45°. The recorded average maximum brightness is 300 cd/m2 with a deviation of 12% which is considered as quite normal. The color temperature is 6742K – close to the optimal one (6500K). The contrast is high 933:1, after the calibration below. Acer Aspire V15 Nitro’s display covers 91% of the sRGB and 70% of the Adobe RGB color gamut. WEB-based colors (sRGB) will only lack small areas of the red and green specter. The gamma has a little deviation, so low light images will appear a bit dim. We’ve set the screen brightness to 200 cd/m2 (59%) in order to reach optimal color temperature of 6500K. After calibration, the average deviation of the DeltaE is 1.24. Before any calibration was done, we’ve measured the default color reproduction, which appeared to be really good. We’ve generated a second profile. The color accuracy can be seen below on the color map. 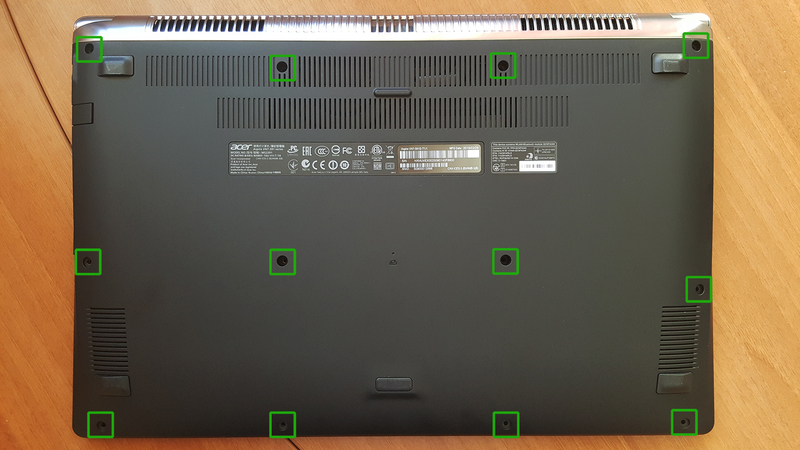 The new Acer Aspire V15 Nitro uses PWM (pulse-width modulation) for controlling the screen brightness, thus making it harmful to human vision. We’ve recorded screen flickering across all brightness levels, but at least the frequency of the emitted light is high enough to be considered less aggressive, which in our case is 20 kHz. After setting the screen brightness above 75% – the frequency becomes even higher. This model uses high quality budget LCD IPS panel, offering excellent viewing angles, high contrast, high maximum brightness, Full HD resolution, and accurate color reproduction. However, we’ve recorded PWM across all brightness levels, which can be considered as a major flaw. 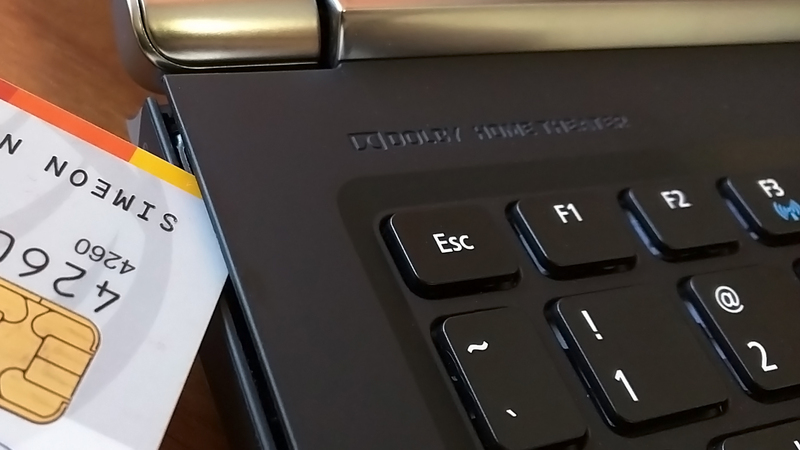 The sound quality coming from the new Acer Aspire V15 Nitro Black Edition really shocked us, but in the good way. We can easily say that this notebook has one of the greatest loudspeakers on the market. It supports a wide variety of frequencies – +/- 6 dB and it produces great sound. It’s important to note that we used uncompressed 16-bit sound file that was played both on Windows Media Player and VLC Player. VLC Player’s sound quality was superior (with default settings on both players). The lowest recorded frequency was impressive and may easily top our charts in terms of sound quality. If you ever lay your eyes on an external sound system for your new Aspire V15 Nitro, don’t bother, you already have one of the greatest loudspeakers on a laptop out there. 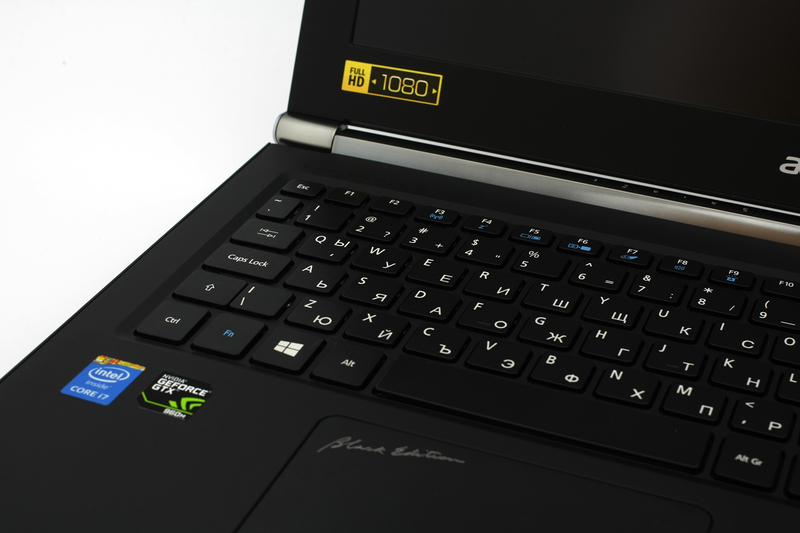 We can’t expect a good battery performance from a gaming notebook, mainly because of the power-hungry hardware – the Intel Core i7-4720HQ CPU and GeForce GTX 960M GPU. Of course, we ran the usual test, which share the same conditions – Wi-FI turned on, Bluetooth is off, power saver is on and screen brightness is set to 120 cd/m2. Quite typical result for a gaming notebook – 233 minutes (3 hours and 53 minutes). Interestingly, a bit lower result than web browsing – 198 minutes (3 hours and 18 minutes). This test got the most of the battery, since it’s the most demanding one – 42 minutes. Yes, we know that this is a gaming machine and it’s not intended for gaming on battery, but fo evaluation reasons we run this sort of tests. Quite disappointing result and most probably the lowest one in our database. All gaming tests are conducted with the latest NVIDIA drivers – 350.05. Under light load (Web surfing, document editing…), you can barely hear the laptop fans and the CPU core temperatures vary between 50 and 65 degrees (coffee). When we put the PC to a max CPU load torture test, the temps rose immediately, nearly touching the 100C Tj.max limit, but the fans quickly increased their rpm and cooled down the CPU to 84-90C, allowing it to turbo boost itself to 2.9 – 3.0 GHz (the base frequency is 2.6 GHz and the max is 3.4GHz for 4 active cores). We left the system in that state for an hour, and then we added max GPU load. In the graphic below, you can see how the GPU load affected the CPU core temperature, which rose to 91-96 C, but the chip was forced to throttle down to 2.2-2.4GHz. GPU temperature hit 88-89C. These aren’t the best results so far, but they aren’t that bad given that you are unlikely to use your system at 100% CPU + GPU load for continuous time. Despite the higher temperatures of the internals, the exterior of the chassis remains relatively cool with the highest point at the top of the machine where the main vents are located. Most importantly, though, the bottom of the machine, where palms rest, remain cool throughout the whole time. 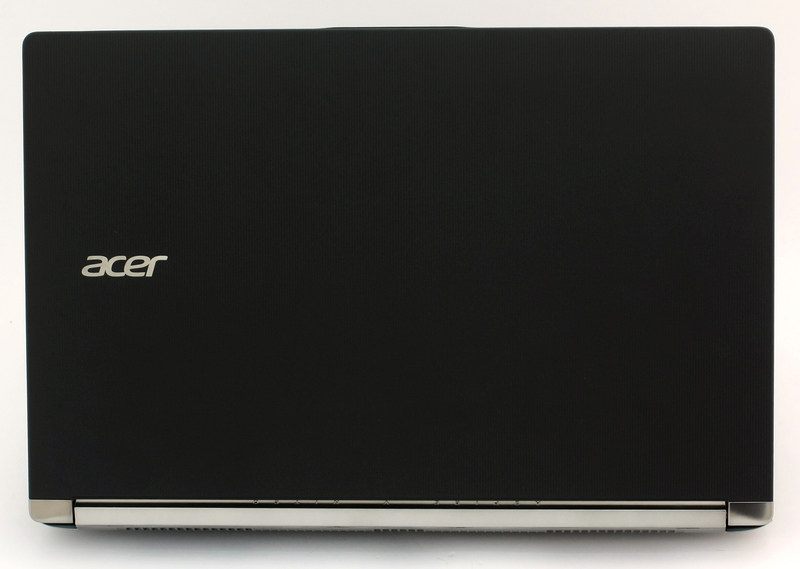 The Acer Aspire V15 Nitro Black Edition remains one of the best choices for a budget gaming laptop on the market and with the refreshed series – this machine gets even better. The design is almost perfect, just the port placement could be better, but still features a high-quality build. The keyboard is also nearly perfect with the red LED backlight. 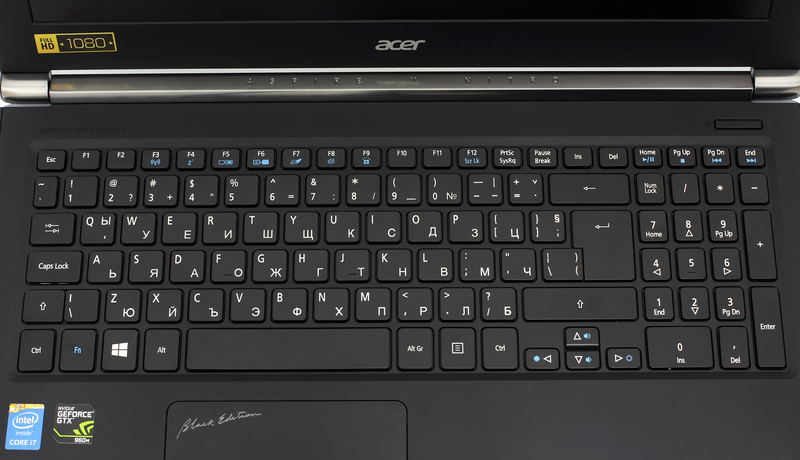 They provide good tactile feedback and the keys are excellent not only for gaming, but even for typing. It’s a good thing that Acer kept the high-quality IPS panel, but this one differs from the original version from last year. Besides the good color accuracy, high contrast and high maximum brightness, this panel uses PWM (pulse-width modulation) across all brightness levels, thus making the user experience less desirable. As far for the hardware inside, the new Aspire V15 Nitro Black Edition packs a real powerhouse with the new Core i7-4720HQ processor, which scores slightly better than last year’s model, along with NVIDIA GeForce GTX 960M – a brand new GPU in the 900M series from the vendor. Our only complaint is the underwhelming battery life (despite the fact that this is a gaming notebook) and the cooling system. The torture tests we ran are nearly impossible to reproduce in real-life conditions, but still the CPU got really hot and reached nearly the maximum operating temperature of 100 degrees. But let’s be honest, you’ll probably end up not using 100% of the CPU and GPU capacity. All and all, we highly recommend considering this notebook if you are looking for a budget gaming machine in a compact form factor. which one is the best (acer vn7-591g gtx960m) vs (lenovo y5070 gtx 960m)? Hi, I live in Italy and I would like to buy one but with english keyboard. If buying from amazon.com i will have to pay 22% VAT in Italy. So it will be very expensive for me. Could you advise an online shop within europe to buy this laptop with acceptable price. Thank you! I made this account just to tell you how detailed, good, thorough.. Just how amazing this review is made! Thank you so much for this and have a nice day! Did you run the tests plugged in? I retested the 3d graphics specifically and it performed a little better. The challenge now is the wireless connectivity is very slow in comparison to other computers on the same network. It also periodically hangs and needs a hard boot to get it back. I bought it for my son, who will probably put up with these issues, but I’m not buying the reviews this laptops get from the online magazines, lesson learned. Ok, I just ran the Unigine Heaven Benchmark 4.0 on my Acer Aspire Nitro, it has the NVIDIA GetForce 945M, I get FPS of 23 and a score of 580. Which appears to be half the score tested above? Not sure I’m happy with the results. Do you think the new model with the skylake processor will fix the previous issues with the low battery life and heat? I’m thinking of buying one but I’m not sure.And is there a better option in that price range. Lenovo y50 maybe? Soon we will post a review of the new ASUS ROG G552 as well, so stay tuned. All these notebooks are in the same price range. Yeah but I’ve heard that the Asus is pretty thick and I don’t really like the design of the Y700 that much,but still it’s not tat bad.Anyways..which one do you think is the best for not that much of traveling but to be somewhat portable and is with a good gaming performance? They all have the same performance. 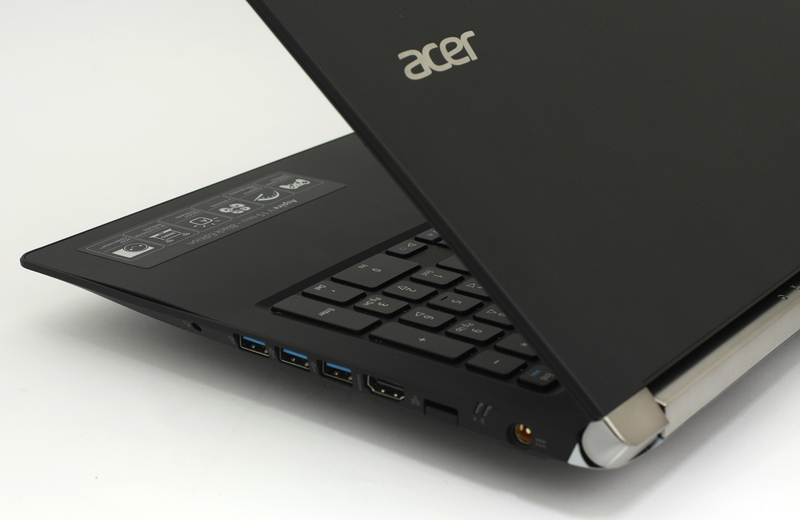 In terms of portability, Acer and Lenovo are the way to go.